SBS has been without a head of television for the past six months. When the previous Managing Director of SBS retired mid last year, other staff soon left. Some were shown the door by the new boss and others walked of their own accord. The head of TV was one of them. Then in October last year, SBS’s Managing Director, Michael Ebeid told Senate Estimates that plans to appoint a new head of television had been dashed. So when the TV schedule was made up for this year, it was done so on a sort of auto pilot; there being no one solely in charge of television. Surprisingly SBS has come up with a schedule that in part, shows lots of promise – if you separate out the ‘more of the same’ stuff. A program not to be missed is Once upon a time in Cabramatta. It airs on 8 January. 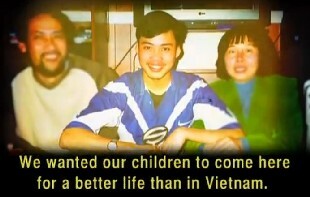 It’s the untold story of how the Vietnamese community overcame the odds and found their place in multicultural Australia. From Prime Minister Fraser’s landmark decision to open Australia’s doors to thousands of refugees at the end of the Vietnam War, this three part series follows the Vietnamese people of Cabramatta as they struggle to find their place in a foreign land. The 80s and 90s see the arrival of street gangs, a heroin epidemic and the first political assassination in Australia’s history. The Vietnamese people are vilified and demonised and it seems Cabramatta represents all that is wrong with Asian immigration. But as the century draws to a close there is a remarkable turnaround and the Vietnamese people finally find their voice – speaking up to claim their rightful place in their adopted home. Cabramatta becomes a community transformed. Australia, a continent changed forever. Some of the other programs that SBS has in store for this year are below. Freddy Flintoff Versus The World – 2 January. Cricketing legend and ultimate bloke, Freddie Flintoff, tries his hand at some of the most extreme sports and challenges on offer around the world. But, ever the competitive sportsman, he won’t be trying anything out without turning it into a competition so he’s also enlisted other athletes who retired at the top of their game to see if they can beat him. Against opponents that include Dennis Rodman, Iwan Thomas and Dennis Wise, Freddie challenges himself at extreme events including the skeleton bob, wing walking and rodeo bull riding. Who Do You Think You Are? resumes early in the new year. The celebrated genealogy series Who Do You Think You Are? returns to SBS for its fourth Australian season. Actor John Wood, funnyman Shaun Micallef, AFL legend Michael O’Loughlin, actress Melissa George, journalist Kerry O’Brien and actor Vince Colosimo take a journey into their family history in this fascinating chronicle of the social, ethnic and cultural evolution of Australia’s national identity. Travelling across the country and around the globe, their personal journeys are revealing, sometimes shocking and always emotional. 24 Hours in Emergency – 5 January. With 70 cameras filming round the clock for 28 days, 24 Hours in A&E offers unprecedented access to one of Britain’s busiest A&E departments, at King’s College Hospital. Each episode focuses on patients who were treated within the same 24-hour period. The series captures the joy and heartache faced by patients and their families, as well as the hard work and professionalism of the A&E staff. From life-threatening traumas to embarrassing mishaps, 24 Hours in A&E is an intimate, powerful and sometimes comic insight into life – and death – on the frontline of a busy hospital. Vet Adventures will screen in January. Vet Adventures follows Dorset vet Luke Gamble as he travels the world treating animals in need. Visiting countries as diverse as India, Grenada, Malawi and Mexico, this unique series sees Luke challenge his skills to treat any species of animal that needs help – both domestic and wild – in places where they have no one else to turn to. One Born Every Minute USA early this year. American version of One Born Every Minute, the show that looks at the drama and emotion of a maternity unit from the perspective of the parents-to-be and the maternity ward staff. Early in February Red Cliff (parts 1 & 2). This film is not to be missed. In Asia the film was originally released in two parts, totalling over four hours in length. The first part was released in July 2008 and the second in January 2009. But outside Asia only a single 2½ hour film was released. SBS will screen the full version in two parts. Set in 208 A.D., in the final days of the Han Dynasty, shrewd Prime Minster Cao Cao convinced the fickle Emperor Han the only way to unite all of China was to declare war on the kingdoms of Xu in the west and East Wu in the south. Thus began a military campaign of unprecedented scale, led by the Prime Minister, himself. Left with no other hope for survival, the kingdoms of Xu and East Wu formed an unlikely alliance. Numerous battles of strength and wit ensued, both on land and on water, eventually culminating in the battle of Red Cliff. During the battle, two thousand ships were burned, and the course of Chinese history was changed forever. Directed by John Woo, it stars Tony Leung, Takeshi Kaneshiro and Zhang Fengyi. Bollywood Star is promised this year too. Inspired by the huge success and influence of Bollywood movies, SBS brings a taste of Bollywood to Australia. Renowned Bollywood producer/director Mahesh Bhatt is offering a place in his next movie to one Australian to become the next Bollywood Star. This four-part series follows the search for an Australian Bollywood star: an unknown who will go on to win the prize of a lifetime – a part in a Bollywood movie. Each applicant will have their own unique set of circumstances and background but all are striving for the same goal – to become a star in the biggest movie industry in the world. The first two episodes will feature a national talent search, whittling down hundreds of applicants to a shortlist of 20. In the final two episodes the participants are reduced to six finalists, who travel to Mumbai for two weeks intensive Bollywood training in singing, dancing and acting with the top Indian industry professionals. The final winner will be selected by Mahesh himself and take away the prize of an exciting role in his next feature film. As well as experiencing the glitz and glamour of the Indian film industry the six finalists will see and live Mumbai life first hand. For some the trip will be more than a competition – it will be a journey of self-discovery and cultural identity. Danger 5 scheduled for February. Set in a bizarre, 1960’s inspired fantasy World War II complete with tropical bars, dancing women, cocktails, cigarettes and talking animals, action comedy series Danger 5 follows a team of five international, super skilled, super good-looking spies on a mission to kill Hitler. Danger 5 is the finest group of special operatives the allies have to offer; Jackson from the USA, Tucker from Australia, Ilsa from Russia, Claire from Britain and Pierre from Europe. Mad Men (series 3) – 18 February. Set in 1960’s New York, Mad Men follows the lives of the ruthlessly competitive men and women of fictional Madison Avenue advertising agency Sterling Cooper; an ego-driven world where key players make an art of the sell while their private world gets sold. In season three, against the backdrop of rapid social and political changes playing out across America in 1963, the conflicted world of Creative Director Don Draper (Jon Hamm) slowly begins to implode as new economic realities threaten the future of Sterling Cooper, and his dark past and constant philandering begin to bear on his faltering marriage to Betty (January Jones). Luke Nguyen’s Greater Mekong – 23 February. Celebrated chef, Luke Nguyen, in the third instalment of his popular series, takes viewers on a culinary journey across the Greater Mekong region of Southeast Asia. Beginning in Yunnan Province, China, Luke takes to the backstreets and traverses mountainsides to prepare the dishes that have sustained customs and communities for centuries. Luke explores how food is integrated into Myanmar’s many ethnic cultures. In Yangon, he cooks with three generations of Burmese women, while in the Shan State he tends to the floating gardens of Inle Lake with Intha farmers. In northern Thailand, Luke learns a thing or two from local Mekong River fishermen. They reveal the Mekong is more than a source of food to the people that live along its shores, it is a way of life. Then in in March it’s the Toughest Place to Be (series 2). This three part series follows three experienced and qualified professionals who find out what it would be like to do their job under some of the toughest conditions on the planet. 2012 Paris-Roubaix can be seen on 29 March. The most prestigious single-day professional road cycling race, the Paris-Roubaix is known for its rough terrain and cobblestones, which make for a gruelling event. Beginning in Compiègne in northern France, the 260km race has been dubbed the Hell of the North and follows a winding route to Roubaix. SBS will show the 2012 Paris-Roubaix live. A program that worth considering later this year is Go Back To Where You Came From – series two. Worth considering because – series one – screened last year, was a brilliant piece of television. The test will be: can SBS come up with the goods again? We hope so. The sad truth is though, that invariably the 2nd or 3rd of any production is often not as good as the first. 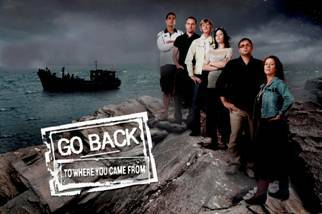 If you missed it, Go Back To Where You Came From – series one, was about racial tensions in Australia. It followed six Australians who travelled on a rickety boat taking the same journey as those seeking asylum here, but in reverse order. They agreed to challenge their preconceived notions about refugees and asylum seekers embarking on a confronting journey. Over the course of the three episodes, prejudices were challenged and insights gained. It was as much an eye opener for the six participants as it was for the audience, as we – the audience – were witness to situations that stirred the deepest of emotions in the most horrific and seemingly hopeless circumstances. It was a rare piece of television. If SBS can do half as good this year, it’ll still be worth watching. 2012 FA Cup Final – 5 May. The best club football teams in the English football leagues go head-to-head in the world’s longest running and most respected club football tournament, the FA Cup. The FA Cup final is one of the most highly-anticipated football matches of the year and showcases the very best of English football. The 2012 FA Cup Final will be broadcast live on SBS from Wembley Stadium. 2012 Tour de France – Saturday 30 June to Monday 23 July. In 2012 SBS will broadcast its 22nd Tour de France with over 60 hours of live coverage in high definition over three weeks. After becoming the first Australian to win the yellow jersey in 2011, Cadel Evans will be looking to take home the title once again. SBS’s coverage of the 2012 Tour de France will include every stage live and exclusive, plus daily highlights. It will be hosted by Michael Tomalaris in his 17th year as host, with commentary from Phil Liggett and Paul Sherwen. The 2011 Tour de France was SBS’s 21st broadcast of the Tour and its most successful to date. 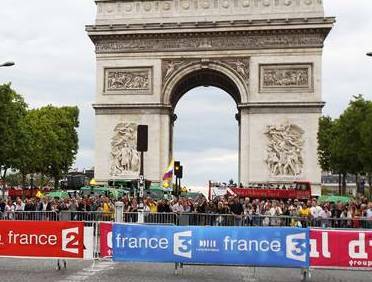 The final stage, broadcast on 24 July, was the most watched Tour de France stage ever in Australia. For up-to-date information on all programs see the SBS schedule. Stay tuned. With the appointment of a head of television there’s more to come.